"How do you solve a problem like Maria? How do you catch a cloud and pin it down?" 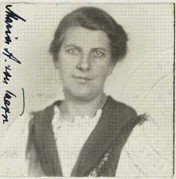 Over on the National Archives website you can find some reproductions of immigration records relating to Austria's famous von Trapp family who inspired the musical, the Sound of Music.